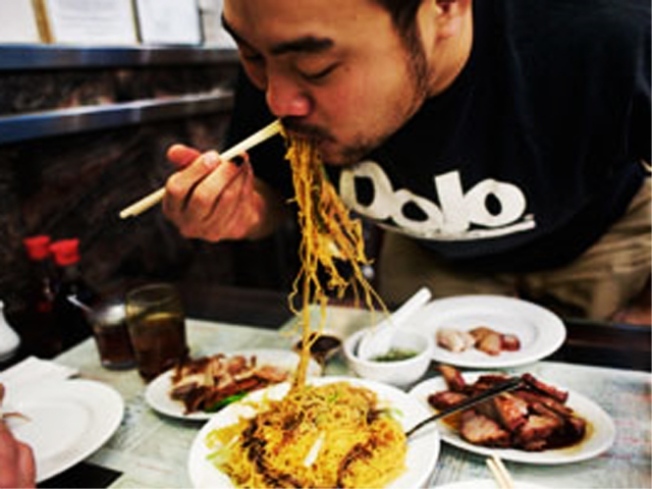 David Chang eats in "The Momofuku Cookbook." Controversial celebrity chef David Chang was in San Francisco last week to explain away his incendiary comments about the City. Change drew the ire of Bay Area foodies when he called "bulls**t" on the city by bay during a public appearance in New York. "There's only a handful of restaurants that are manipulating food ... f***ing every restaurant in San Francisco is serving figs on a plate with nothing on it," he said. And while his comments may have turned a few off to his raman empire, Chang may have been right all along. Alice Waters, one of the Bay Area's most well known (and mocked in some circles) celebrity chefs, may have proven Chang's genius. SFist points out the slow food cooking Berkeley, Calif. restaurant is serving figs in a bowl for $8.25. So it's not a plate, close enough.